Rotational Molding (BrE moulding) involves a heated hollow mold which is filled with a charge or shot weight of material. It is then slowly rotated (usually around two perpendicular axes), causing the softened material to disperse and stick to the walls of the mold. In order to maintain even thickness throughout the part, the mold continues to rotate at all times during the heating phase and to avoid sagging or deformation also during the cooling phase. The process was applied to plastics in the 1950s but in the early years was little used because it was a slow process restricted to a small number of plastics. Over time, improvements in process control and developments with plastic powders have resulted in a significant increase in usage. Rotocasting (also known as rotacasting), by comparison, uses self-curing resins in an unheated mould, but shares slow rotational speeds in common with rotational molding. Spin casting should not be confused with either, utilizing self-curing resins or white metal in a high-speed centrifugal casting machine. In 1855, R. Peters of Britain documented the first use of biaxial rotation and heat. This rotational molding process was used to create metal artillery shells and other hollow vessels. The main purpose of using rotational molding was to create consistency in wall thickness and density. In 1905 in the United States F.A. Voelke used this method for the hollowing of wax objects. This led to G.S. Baker's and G.W. Perks's process of making hollow chocolate eggs in 1910. Rotational molding developed further and R.J. Powell used this process for molding plaster of Paris in the 1920s. These early methods using different materials directed the advancements in the way rotational molding is used today with plastics. Plastics were introduced to the rotational molding process in the early 1950s. One of the first applications was to manufacture doll heads. The machinery was made of an E Blue box-oven machine, inspired by a General Motors rear axle, powered by an external electric motor and heated by floor-mounted gas burners. The mold was made out of electroformed nickel-copper, and the plastic was a liquid PVC plastisol. The cooling method consisted of placing the mold into cold water. This process of rotational molding led to the creation of other plastic toys. As demand for and popularity of this process increased, it was used to create other products such as road cones, marine buoys, and car armrests. This popularity led to the development of larger machinery. A new system of heating was also created, going from the original direct gas jets to the current indirect high velocity air system. In Europe during the 1960s the Engel process was developed. This allowed large hollow containers to be manufactured in low-density polyethylene. The cooling method consisted of turning off the burners and allowing the plastic to harden while still rocking in the mold. In 1976, the Association of Rotational Moulders (ARM) was started in Chicago as a worldwide trade association. The main objective of this association is to increase awareness of the rotational molding technology and process. In the 1980s, new plastics, such as polycarbonate, polyester, and nylon, were introduced to rotational molding. This has led to new uses for this process, such as the creation of fuel tanks and industrial moldings. The research that has been done since the late 1980s at Queen's University Belfast has led to the development of more precise monitoring and control of the cooling processes based on their development of the “Rotolog system”. Rotational molding machines are made in a wide range of sizes. They normally consist of molds, an oven, a cooling chamber, and mold spindles. The spindles are mounted on a rotating axis, which provides a uniform coating of the plastic inside each mold. Molds (or tooling) are either fabricated from welded sheet steel or cast. The fabrication method is often driven by part size and complexity; most intricate parts are likely made out of cast tooling. Molds are typically manufactured from stainless steel or aluminum. Aluminum molds are usually much thicker than an equivalent steel mold, as it is a softer metal. This thickness does not affect cycle times significantly since aluminum's thermal conductivity is many times greater than steel. Due to the need to develop a model prior to casting, cast molds tend to have additional costs associated with the manufacturing of the tooling, whereas fabricated steel or aluminum molds, particularly when used for less complex parts, are less expensive. However, some molds contain both aluminum and steel. This allows for variable thicknesses in the walls of the product. While this process is not as precise as injection molding, it does provide the designer with more options. The aluminum addition to the steel provides more heat capacity, causing the melt-flow to stay in a fluid state for a longer period. Normally all rotation molding systems have a number of parts including molds, oven, cooling chamber and mold spindles. The molds are used to create the part, and are typically made of aluminium. The quality and finish of the product is directly related to the quality of the mold being used. The oven is used to heat the part while also rotating the part to form the part desired. The cooling chamber is where the part is placed until it cools, and the spindles are mounted to rotate and provide a uniform coat of plastic inside each mold. This is a specialized machine designed mainly to produce long narrow parts. Some are of the clamshell type, thus one arm, but there are also shuttle-type Rock & Roll machines, with two arms. Each arm rotates or rolls the mold 360 degrees in one direction and at the same time tips and rocks the mold 45 degrees above or below horizontal in the other direction. Newer machines use forced hot air to heat the mold. These machines are best for large parts that have a large length-to-width ratio. Because of the smaller heating chambers, there is a saving in heating costs compared to bi-axial machines. This is a single arm rotational molding machine. The arm is usually supported by other arms on both ends. The clamshell machine heats and cools the mold in the same chamber. It takes up less space than equivalent shuttle and swing arm rotational molders. It is low in cost compared to the size of products made. It is available in smaller scales for schools interested in prototyping and for high quality models. More than one mold can be attached to the single arm. The loading and unloading area is at the front of the machine between the heating and cooling areas. These machines vary in size between small to medium compared to other rotational machines. Vertical rotational molding machines are energy efficient due to their compact heating and cooling chambers. These machines have the same (or similar) capabilities as the horizontal carousel multi-arm machines, but take up much less space. Most shuttle machines have two arms that move the molds back and forth between the heating chamber and cooling station. The arms are independent of each other and they turn the molds bi-axially. In some cases, the shuttle machine has only one arm. This machine moves the mold in a linear direction in and out of heating and cooling chambers. It is low in cost for the size of product produced and the footprint is kept to a minimum compared to other types of machines. It is also available in smaller scale for schools and prototyping. The swing-arm machine can have up to four arms, with a bi-axial movement. Each arm is independent from each other as it is not necessary to operate all arms at the same time. Each arm is mounted on a corner of the oven and it swings in and out of the oven. On some swing-arm machines, a pair of arms is mounted on the same corner, thus a four-arm machine has two pivot points. These machines are very useful for companies that have long cooling cycles or require a lot of time to demold parts, compared to the cook time. It is a lot easier to schedule maintenance work or try to run a new mold without interrupting production on the other arms of the machine. This is one of the most common bi-axial machines in the industry. It can have up to 4 arms and six stations and it comes in a wide range of sizes. The machine comes in two different models, fixed and independent. A fixed-arm carousel consists of 3 fixed arms that must move together. One arm will be in the heating chamber while the other is in the cooling chamber and the other in the loading/reloading area. The fixed-arm carousel works well when working with identical cycle times on each arm. The independent-arm carousel machine is available with 3 or 4 arms that can move separately from the other. This allows for different size molds, with different cycle times and thickness needs. Until recently, the process largely relied on both trial and error and the experience of the operator to determine when the part should be removed from the oven and when it was cool enough to be removed from the mold. Technology has improved in recent years, allowing the air temperature in the mold to be monitored, removing much of the guesswork from the process. Much of the current research is into reducing the cycle time, as well as improving part quality. The most promising area is in mold pressurization. It is well known that applying a small amount of pressure internally to the mold at the correct point in the heating phase accelerates coalescence of the polymer particles during the melting, producing a part with fewer bubbles in less time than at atmospheric pressure. This pressure delays the separation of the part from the mold wall due to shrinkage during the cooling phase, aiding cooling of the part. The main drawback to this is the danger to the operator of explosion of a pressurized part. This has prevented adoption of mold pressurization on a large scale by rotomolding manufacturers. Sacrificial coatings: the coating of MRA has to be applied each time because most of the MRA comes off on the molded part when it releases from the tool. Silicones are typical MRA compounds in this category. Semi-permanent coatings: the coating, if applied correctly, will last for a number of releases before requiring to be re-applied or touched up. This type of coating is most prevalent in today's rotational molding industry. The active chemistry involved in these coatings is typically a polysiloxane. Permanent coatings: most often some form of PTFE coating, which is applied to the mold. Permanent coatings avoid the need for operator application, but may become damaged by misuse. More than 80% of all the material used is from the polyethylene family: cross-linked polyethylene (PEX), low-density polyethylene (LDPE), linear low-density polyethylene (LLDPE), high-density polyethylene (HDPE), and regrind. Other compounds are PVC plastisols, nylons, and polypropylene. Recently it has become possible to use natural materials in the molding process. Through the use of real sands and stone chip, sandstone composite can be created which is 80% natural non-processed material. Rotational molding of plaster is used to produce hollow statuettes. Chocolate is rotationally molded to form hollow treats. Designers can select the best material for their application, including materials that meet U.S. Food and Drug Administration (FDA) requirements. Additives for weather resistance, flame retardation, or static elimination can be incorporated. Inserts, graphics, threads, handles, minor undercuts, flat surfaces without draft angles, or fine surface detail can be part of the design. Designs can also be multi-wall, either hollow or foam filled. Products that can be manufactured using rotational molding include storage tanks, furniture, road signs and bollards, planters, pet houses, toys, bins and refuse containers, doll parts, road cones, footballs, helmets, canoes, rowing boats, tornado shelters, kayak hulls, underground cellars for vine and vegetables storage and playground slides. The process is also used to make highly specialised products, including UN-approved containers for the transportation of nuclear fissile materials, anti-piracy ship protectors, seals for inflatable oxygen masks and lightweight components for the aerospace industry. A blind brass threaded hex insert molded into a liquid storage tank. Another consideration is in the draft angles. These are required to remove the piece from the mold. On the outside walls, a draft angle of 1° may work (assuming no rough surface or holes). On inside walls, such as the inside of a boat hull, a draft angle of 5° may be required. This is due to shrinkage and possible part warping. Another consideration is of structural support ribs. While solid ribs may be desirable and achievable in injection molding and other processes, a hollow rib is the best solution in rotational molding. A solid rib may be achieved through inserting a finished piece in the mold but this adds cost. Rotational molding excels at producing hollow parts. However, care must be taken when this is done. When the depth of the recess is greater than the width there may be problems with even heating and cooling. Additionally, enough room must be left between the parallel walls to allow for the melt-flow to move properly throughout the mold. Otherwise webbing may occur. A desirable parallel wall scenario would have a gap at least three times the nominal wall thickness, with five times the nominal wall thickness being optimal. Sharp corners for parallel walls must also be considered. With angles of less than 45° bridging, webbing, and voids may occur. Another consideration is the melt-flow of materials. Certain materials, such as nylon, will require larger radii than other materials. Additionally, the stiffness of the set material may be a factor. More structural and strengthening measures may be required when a flimsy material is used. One benefit of rotational molding is the ability to experiment, particularly with wall thicknesses. Cost is entirely dependent on wall thickness, with thicker walls being costlier and more time consuming to produce. While the wall can have nearly any thickness, designers must remember that the thicker the wall, the more material and time will be required, increasing costs. In some cases, the plastics may significantly degrade due to extended periods at high temperature. Also, different materials have different thermal conductivity, meaning they require different times in the heating chamber and cooling chamber. Ideally, the part will be tested to use the minimum thickness required for the application. This minimum will then be established as a nominal thickness. For the designer, while variable thicknesses are possible, a process called stop rotation is required. This process is limited in that only one side of the mold may be thicker than the others. After the mold is rotated and all the surfaces are sufficiently coated with the melt-flow, the rotation stops and the melt-flow is allowed to pool at the bottom of the mold cavity. Wall thickness is important for corner radii as well. Large outside radii are preferable to small radii. Large inside radii are also preferable to small inside radii. This allows for a more even flow of material and a more even wall thickness. However, an outside corner is generally stronger than an inside corner. Rotational molding offers design advantages over other molding processes. With proper design, parts assembled from several pieces can be molded as one part, eliminating high fabrication costs. The process also has inherent design strengths, such as consistent wall thickness and strong outside corners that are virtually stress free. For additional strength, reinforcing ribs can be designed into the part. Along with being designed into the part, they can be added to the mold. The ability to add prefinished pieces to the mold alone is a large advantage. Metal threads, internal pipes and structures, and even different colored plastics can all be added to the mold prior to the addition of plastic pellets. However, care must be taken to ensure that minimal shrinkage while cooling will not damage the part. This shrinking allows for mild undercuts and negates the need for ejection mechanisms (in most pieces). In some cases rotational molding can be used as a feasible alternative to blow molding, this is due to the similarity in product outputs, with products such as plastic bottles and cylindrical containers, this is only effective on a smaller scale as it much more costly to blow mold regarding a small output, and with fewer resulting products rotational molding is much cheaper, due to blow molding relying on economies of scale regarding efficiency. Another advantage lies in the molds themselves. Since they require less tooling, they can be manufactured and put into production much more quickly than other molding processes. This is especially true for complex parts, which may require large amounts of tooling for other molding processes. Rotational molding is also the process of choice for short runs and rush deliveries. The molds can be swapped quickly or different colors can be used without purging the mold. With other processes, purging may be required to swap colors. Due to the uniform thicknesses achieved, large stretched sections are nonexistent, which makes large thin panels possible (although warping may occur). Also, there is little flow of plastic (stretching) but rather a placing of the material within the part. These thin walls also limit cost and production time. Another cost advantage with rotational molding is the minimal amount of material wasted in production. There are no sprues or runners (as in injection molding), no off-cuts , or pinch off scrap (blow molding). What material is wasted, through scrap or failed part testing, can usually be recycled. 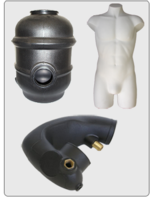 Rotationally molded parts have to follow some restrictions that are different from other plastic processes. As it is a low pressure process, sometimes designers face hard to reach areas in the mold. Good quality powder may help overcome some situations, but usually the designers have to keep in mind that it is not possible to make sharp threads that would be possible with injection molding. Some products based on polyethylene can be put in the mold before filling it with the main material. This can help to avoid holes that otherwise would appear in some areas. This could also be achieved using molds with movable sections. Another limitation lies in the molds themselves. Unlike other processes where only the product needs to be cooled before being removed, with rotational molding the entire mold must be cooled. While water cooling processes are possible, there is still a significant down time of the mold. Additionally, this increases both financial and environmental costs. Some plastics will degrade with the long heating cycles or in the process of turning them into a powder to be melted. The stages of heating and cooling involve transfer of heat first from the hot medium to the polymer material and next from it to the cooling environment. In both cases, the process of heat transfer occurs in an unsteady regime; therefore, its kinetics attracts the greatest interest in considering these steps. In the heating stage, the heat taken from the hot gas is absorbed both by the mold and the polymer material. The rig for rotational molding usually has a relatively small wall thickness and is manufactured from metals with a high thermal conductivity (aluminum, steel). As a rule, the mold transfers much more heat than plastic can absorb; therefore, the mold temperature must vary linearly. The rotational velocity in rotational molding is rather low (4 to 20 rpm). As a result, in the first stages of the heating cycle, the charged material remains as a powder layer at the bottom of the mold. The most convenient way of changing the cycle is by applying PU sheets in hot rolled forms. Due to high temperatures within the mold the plastic must have a high resistance to permanent change in properties caused by heat (high thermal stability). The molten plastic will come into contact with the oxygen inside the mold—this can potentially lead to oxidation of the melted plastic and deterioration of the material's properties. Therefore, the chosen plastic must have a sufficient amount of antioxidant molecules to prevent such degradation in its liquid state. Because there is no pressure to push the plastic into the mold, the chosen plastic must be able to flow easily through the cavities of the mold. The part's design must also take into account the flow characteristics of the particular plastic chosen. ^ Beall 1998, p. 6. ^ a b c Ward, Noel M. (Winter 1997). "A History of Rotational Moulding". Platiquarian Reprints. Archived from the original on 2009-12-03. Retrieved 2009-12-03. ^ Todd, Allen & Alting 1994, pp. 265–266. ^ Beall 1998, p. 154. ^ a b Beall, Glenn (1998). Rotational Molding. Hanser Gardner Publications. p. 152. ISBN 978-1-56990-260-8. ^ a b Beall 1998, p. 155. ^ John Vogler (1984). Small Scale Recycling of Plastics. Intermediate Technology Publication. p. 8. ^ a b Beall 1998, p. 18. ^ "Storm Shelters Tornado Shelter Underground Shelters Granger ISS". www.grangeriss.com. Retrieved 2018-02-25. ^ Beall 1998, p. 69. ^ Beall 1998, pp. 75–77. ^ Beall 1998, p. 71. ^ a b c Beall 1998, p. 70. Beall, Glenn (1998), Rotational Molding, Hanser Gardner Publications, ISBN 978-1-56990-260-8. Todd, Robert H.; Allen, Dell K.; Alting, Leo (1994), Manufacturing Processes Reference Guide, Industrial Press Inc., ISBN 0-8311-3049-0. Thompson, R (2007), Manufacturing Processes for Design Professionals, Thames & Hudson. Revyako, M (2010), Certain Problems of Heat and Mass Transfer in Rotational Molding, Journal of Engineering Physics & Thermophysics. Wikimedia Commons has media related to Rotational moulding. This page was last edited on 31 January 2019, at 02:44 (UTC).